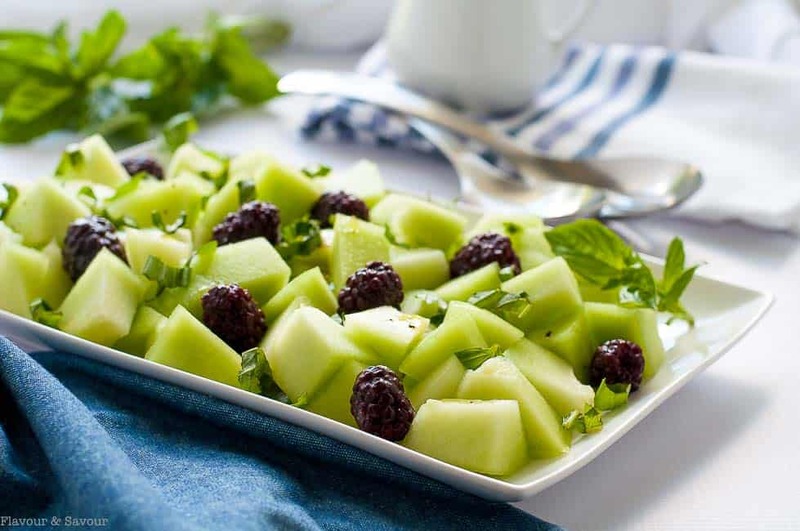 Sweet honeydew, tart blackberries and pungent basil combine to make this fresh Blackberry Honeydew Salad with Basil as appetizing to look at as it is to eat. 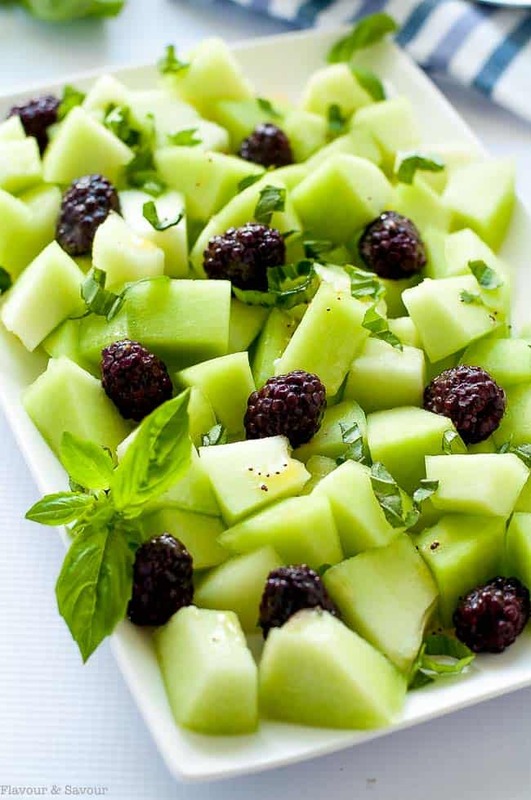 This Blackberry Honeydew Salad with Basil is just that–honeydew melon, blackberries and basil. It hardly needs a recipe and yet . . . here it is! Being a true Canadian, I’m apologizing before I even start! #Sorrynotsorry. But this salad is so pretty, and so tasty, that I just had to post it here. The hardest part of this recipe is finding a perfectly ripe honeydew melon. If you’ve ever had one that is not at the peak of perfection, you have probably found it to be tasteless or even mealy. 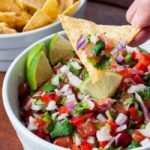 Sometimes I just hold my breath and hope for the best, but here are a few tips to help you choose a ripe one. Look at the skin. It should be dull. If it’s shiny, it’s probably overripe. Choose one that has no soft spots or signs of damage. The melon should be fairly heavy for its size. Most importantly, find the end where it was joined to the vine and have a sniff. It should smell fresh and sweet. I was a happy camper when I cut this one in half. Perfection! Cut the melon in half, scoop out the seeds, dice the fruit and remove the rind. Arrange on a platter, sprinkle with blackberries, basil leaves and a sprinkle or two of sea salt. Top with a drizzle of Lemon Poppy Seed Dressing and serve! 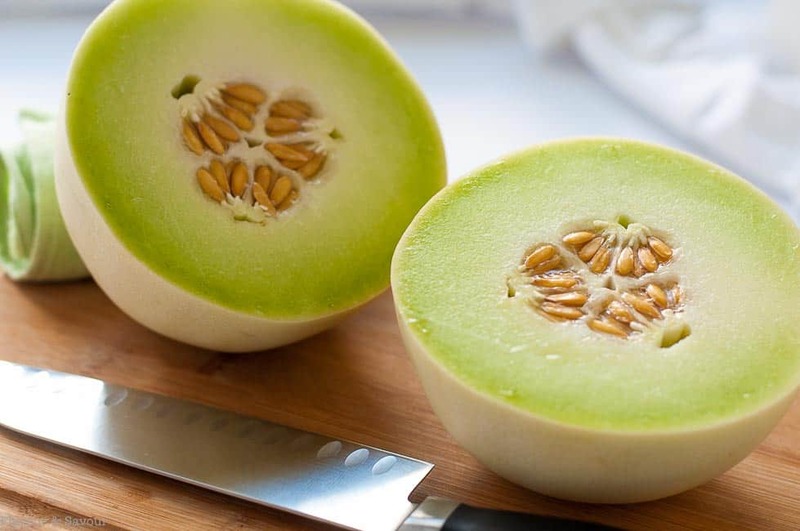 Slice honeydew melon in half and remove seeds. 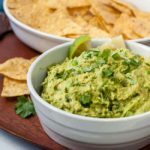 Remove rind and chop into bite-sized pieces. Arrange on a platter with blackberries. Garnish with basil leaves. Whisk dressing ingredients together and drizzle on salad just before serving. Love melon? 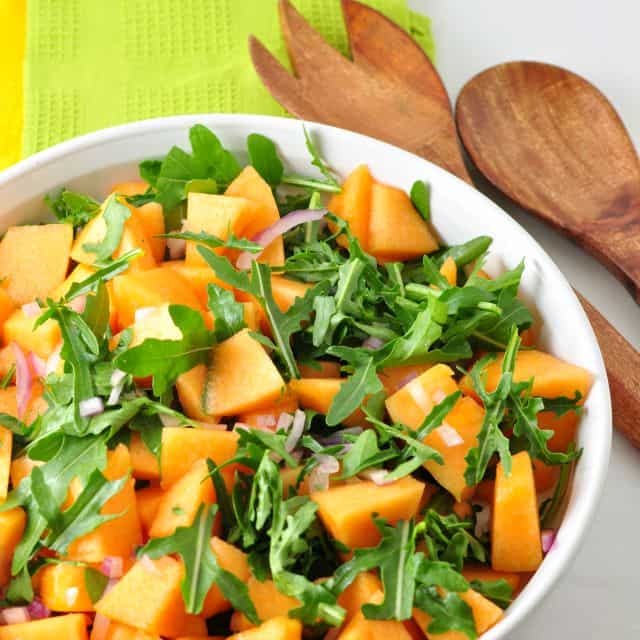 You may also like this Cantaloupe Arugula Salad. Lol! This one gets ooh’s and aah’s because it’s so pretty–it’s also so ridiculously easy! Such a beautiful salad! I just love the color. Definitely perfect for summer. Thanks Tara! It is a showstopper with those fresh blackberries! What a lovely and refreshing way to use this season’s lovely blackberries! 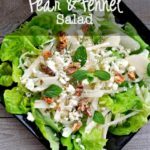 Thanks Kate–I love the contrast in colours in this salad! Simple, but what a wonderful combination! 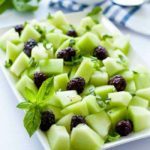 I love the tart berries with the sweet melon – perfect, and so refreshing. The color on this salad is absolutely gorgeous. 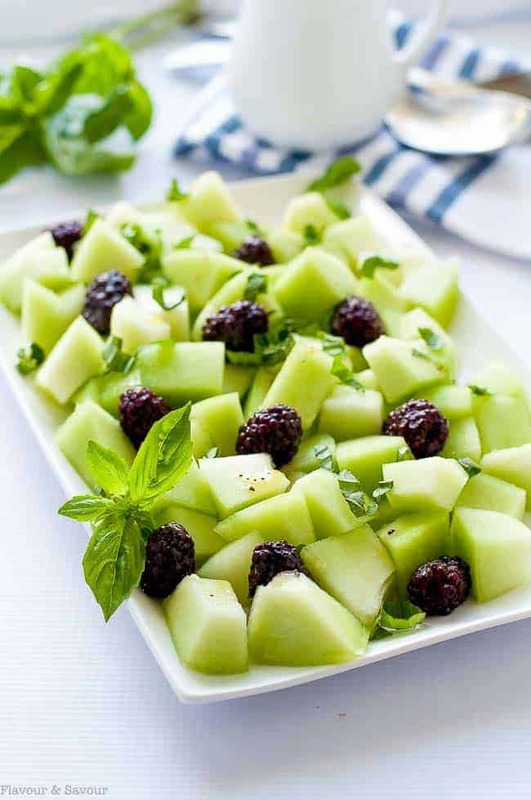 I love honeydew and I love black berries. 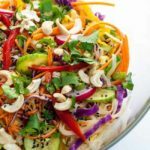 This salad screams summer.